Bio Green products are complete nutrient fertilizers. This means that they contain or make available through natural processes, the widely known macro nutrients: Nitrogen, Phosphorous and Potassium. Bio Green products also contain micronutrients, which are essential for plant growth. Our complete formulas ensure that plants get all that is needed to thrive during the growing season and soil organisms get all that is needed to build and maintain healthy topsoil. The Bio Green Soil Amending Fertilizer Application is applied to your lawn. This natural fertilizer application is customized to your lawn dependent upon turf type and time of year. When the soil is cool and less active, we apply more plant nutrients. When the soil is warm and active, we apply more soil amendments, which build topsoil and soil fertility so your lawn and landscape will stay healthy and happy until your next service call. Bio Green feeds trees all of the nutrients they need through trunk and foliar feeding. Through this type of Tree Fertilizer Application, the special blend of nutrients and supplements are absorbed into the circulatory system of the tree where they do the most good for the health of the tree. The plant nutrition needs for shrubs and landscape bedding plants are different from those of turf grasses. For this reason, Bio Green service technicians have a specially formulated fertilizer that will produce healthy plants and beautiful flora and fauna. 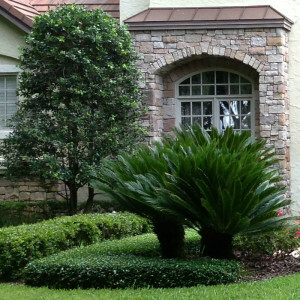 Our team is committed to providing superior services and competitive pricing to all other fertilization companies. For the most environmentally safe approach to beautiful and healthy landscaping, call us – your local Bio Green Licensed Service Provider.